Everyone needs a little heart-to-heart pillow talk every once in a while, so let's talk pillow cushions. The colder weather seasons are upon us, which means its time to make your home nice and cozy for family and guests. Pillowed cushions = cozy. Mission accomplished. Rule #1 - There's no such thing as too many. The more pillows and cushions that adorn your bed, couches and chairs, the more comfortable you will be. Use them to provide lumbar support, to elevate your feet after a long day and put a couple underneath your head for the perfect lounging angle. Use a mixture of plain and patterned materials so you can mix and match them accordingly. Rule #2 - There's a pillow for every season. Or, more precisely, there's a pillow sham for every season. 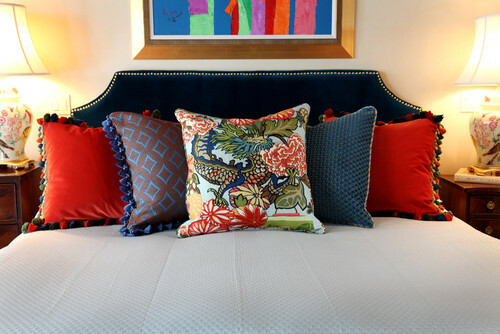 That's one of the best things about pillows, a simple change in pillow shams will transform your decor. You can be bold and sassy one day, and demure and delicate the next. There are holiday-themed shams to match any season. Rule #3 - Floors need cushions too! For floor lounging, people need cushions too. Ever get the urge to just flop down on the floor and stretch out? That's when linen floor cushions are super handy. The Napoli Vintage Floor cushions have transformed traditional table linens into durable, comfortable linen floor cushions that are easy to store when not in use. We recommend purchasing more than one. Linens by Didriks has linen throw pillows, blankets and bedding for year-round comfort.